About his work The Dead Sea in Three Parts, part of the exhibition HIWAR, Conversations in Amman, presented at Darat al Funun. On 29 November 1947, the General Assembly at the United Nations adopted UN Resolution 181(II), recommending adoption and implementation of the 'Plan of partition with economic union', dividing Palestine into an Arab state and a Jewish state, with a special regime for Jerusalem. Specifically excluded from the Arab state was 'a strip along the coast of the Dead Sea not more than seven kilometres in depth, as far as Ein Geddi, whence it turns due east to join the Transjordan frontier in the Dead Sea.' Essentially, with the stroke of a pen, the Dead Sea was neatly divided into three parts: the eastern half falling to what is now Jordan, and the western half split into two, the larger top end attributed to what is now the West Bank, and the bottom end to what is now Israel. It hardly needs saying that the ruthless ripple effects of the 1947 UN Partition Plan have reverberated throughout the region, indeed, throughout the world, until today, and are at the heart of much human suffering. The almost anecdotal partition of a body of water that is not for nothing named the 'Dead' Sea, has within this wider context understandably been relegated to not more than a footnote in the annals of history. It is however precisely those overlooked narratives and accidents of geography that interest Lebanese artist Rayyane Tabet. His work The Dead Sea in Three Parts (2013) is an elephantine floor piece comprised of three large mud-covered structures that are made-to-scale representations of the partitioned Dead Sea. The largest piece -signifying the Jordanian part- is upstanding, be it precariously balanced on a relatively small base point, while the other two smaller pieces -the West Bank's and Israel's- have almost carelessly fallen on their sides, as if sliced off with a knife. Installed on site in Amman, Jordan, at Darat al Funun's Lab, the work is clearly visible through the large windows from the lower-lying street. That is, the main Jordanian segment is on view, looming up like a ship. The other two parts remain hidden behind their bigger brother until you enter the space itself and confront the work head-on. One can easily imagine the political metaphors deftly embedded in this presentation, but when taking a closer look, the causes and consequences of the underlying socio-political histories do not actually seem to be Tabet's primary focus. They merely provide a convenient starting point for his quest, or perhaps obsession, to concentrate on the formal aspects provided by these narratives. It is as if he wants us to know that decisions such as those made by the UN Partition Plan have not only affected the human population, but also had consequences for inanimate shapes and objects. Paradoxically, precisely through his formal visualisations, he draws our attention back to the narrative triggers and the human stories they tell. This constant attraction and contradiction between form and fact (or sometimes form and fiction) is what sets him apart from many of his contemporaries as well as his predecessors. If, as is often said, minimalism formally expressed a 'less is more' and conceptual artists said 'more with less', Tabet's work uses a strictly minimalist formalism to distill hugely complicated and decidedly non-linear histories and stories. And, unlike many of his peers working with archival and historical materials, form and material to Tabet are never secondary. It is perhaps fitting that the roof of the same Lab now showing The Dead Sea in Three Parts, is a permanent home to one of Tabet's earlier works, Fossils, 2008, part of Five Distant Memories: The Suitcase, The Room, The Toys, The Boat, and Maradona (2006-ongoing). 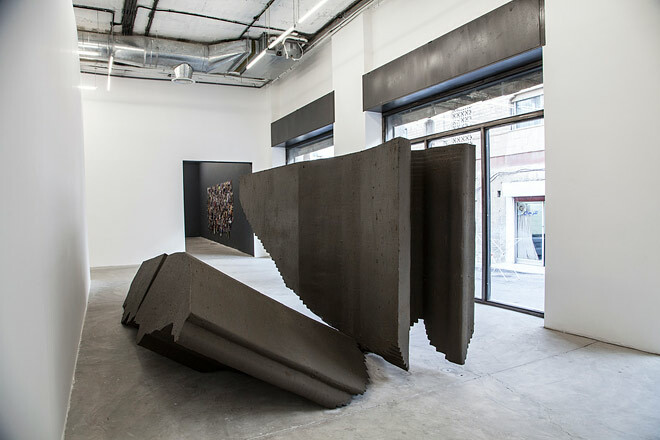 Consisting of seven concrete-covered suitcases of various dimensions, they are based on Tabet's childhood memories during the Lebanese civil war of being permanently packed, ready to go in case of emergency. The materiality of the work - the concrete defying the purpose of the packed luggage, and the grey cement colour conjuring up connotations of refugees covered in ashes and building debris - aptly covers not just the artist's personal story, but signifies a much broader context. The Dead Sea in Three Parts was made and exhibited in the context of HIWAR, Conversations in Amman, a residencies, talks and exhibition program curated by Adriano Pedrosa to celebrate Darat al Funun's 25 years of supporting the arts. Tabet was one of 14 artists from his generation, all from the South of the world, who were invited to have a month-long residency at Darat al Funun, divided into two groups. During their stay the seven artists from each group had the chance to learn from each other, and get to know more about each other's work, background, and context. The residencies culminated in an exhibition that also shows works from The Khalid Shoman Collection. Although the residency artists were not asked to produce new work within this relatively short time, almost all ended up doing so. One of the more unexpected discoveries of The Dead Sea in Three Parts is that it is subtly changing during the course of the exhibition. Not just because many of the visitors cannot resist touching the dark mud that covers the installation, but most of all because Dead Sea mud is surprisingly alive. As the water slowly evaporates, salt crystals appear on the surfaces, glistening in the light. At the same time, salty water invisibly drips to the floor, creating white-rimmed circles on the concrete. It goes to show that forms can cover stories of the past, be rooted in the present, and have a life in the future. Artistic Director at Darat al Funun in Amman, Jordan.